I made a list with a couple of hidden features that I find useful when working with Oxygen. If you have other suggestions, features that you use very often, we will be happy if you share them with us. A reduced version of the Find / Replace dialog is available as a toolbar, displayed at the bottom of the Oxygen window. Press Alt + Shift + F to display it, and ESC to close it and give the focus in editor. To wrap some text in an element use Surround with Tags(Ctrl+E) action. To unwrap just delete the start tag or the end tag, or use the Delete Element Tags(Alt+Shift+X) action. Dynamic Help view is a help window that changes its content to display the help section referring to the currently selected view from Oxygen. Also the help system is context sensitive: press F1 in any dialog to quickly access the relevant help section of the User Manual. By holding down Ctrl (CMD on Mac) in the Text editing mode some components become links that you can follow to get to the definition of those components. For example, in an XML document, an element name becomes a link to that element definition in the associated schema or DTD. In an XSL stylesheet, a variable reference becomes a link to that variable definition, and so on. 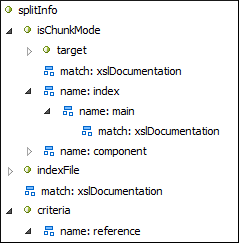 The Component Dependencies view presents a tree of component dependencies starting with a specified component. Allows you to spot the dependencies for the selected component of an XSLT stylesheet, an XML Schema, a Relax NG schema, or a NVDL schema. For example you can quickly see from where an XSLT variable is called, and if called from other variables, functions or named templates, you can expand further to see where they are called from. When working with documents that do not specify a schema, or for which the schema is not known or does not exist, Oxygen is able to learn and translate the document structure to a DTD. Allows you to easily modify the occurrences of the text found through executing a find operation or an XPath expression. When you use this action, a thin rectangle replaces the highlights and lets you start editing. If you work on multiple projects or multiple XML vocabularies, you can choose to keep a separate layout for each project. Thus when you move between projects you get not only the last opened files specific to that project restored but also the exact layout of views, editors and toolbars.. Enable Options->Preferences-> Perspectives Layout, the "Remember layout changes for each project" option and then Oxygen will remember the exact layout for each project. Enable "Show memory status" option to view the memory Oxygen XML Editor uses. To free memory, click the Run Garbage Collector button located in the bottom right corner of the screen. The memory status bar has a light blue background which turns yellow or red when Oxygen XML Editor uses too much memory. You are able to control the visibility of the element names in the Outline View. Hiding element names allows you to focus more on the document content. 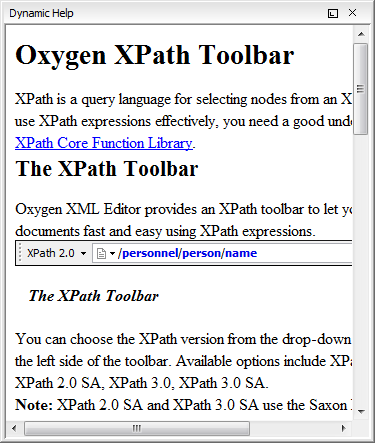 Oxygen helps you edit XML modules referred using XInclude or External Entities. 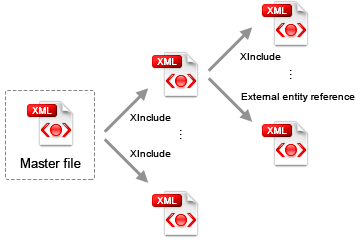 By setting the XML Master File, Oxygen provides a context to solve issues like module validation, editing using the content completion assistant, ID referencing or XML module connection overview (understanding how modules are connected with each other).